Luxembourg is tiny and quite old, known to be neutral and rumored to be very wealthy for many reasons. As for size, well the little country is so small that Rhode Island actually rivals it in square miles. Old, well the capital, Luxembourg City is 1000 years old and growing older with grace and style. Wealth is common in the Grand Duchy since it is the financial center for Europe with as many as 250 financial institutions. Luxembourg’s neutrality lies in that the country borders France, Germany, and Belgium. Languages spoken are German and French, but don’t think Luxembourgers don’t have their own individualism because they do and their own language is appropriately called Luxembourgish. However, when it comes to understanding the natives of Luxembourg, there is a strong predilection for languages and the country holds the trump card in history distinguishing itself at the top of the “European culture” ladder. History is common, of course, with that 1000-year-old trump to play, but it doesn’t stop there. In fact, there is one thing for sure, while the history is strong and very impressive I had not been briefed on the cosmopolitan flair I found everywhere in both the capital and throughout the countryside. The Old Town and Fortress area of Luxembourg was recently added to the list of UNESCO World Culture Heritage sites and the place does allow for a good glimpse of history and imagination. Luxembourg has struggled for her independence many times during a long history and her people are aware of the past. In the entire country however, you will only find hospitable, friendly folks with a smile on their face and a story to tell. There are five regions in Luxembourg and as you venture outside Luxembourg City you will the Ardennes, the Moselle, Mullerthal and the Land of Red Rocks — all these areas quite diverse and interesting. and while I was there I visited the castle in the town of Vianden. While I only had time to get to the one castle, it was the most magnificent one anyway sitting high atop a hill and reflecting an air of sophistication in her history and charm. In fact, the castle was so impressive it was featured in the film “Dracula.” The Vianden castle is the largest feudal castle in the Grand Duchy, cradle of the Orange-Nassau Dynasty, the Royal Houses of Luxembourg and the Netherlands. We received a private tour of the castle and the view from the top was spectacular – it was a cold snowy day and the sun was beginning to set – it was easy to be transported back in time wondering if perhaps Dracula really did reside down in the cellar somewhere. As for the age of the castle, it was built between the 11th and the 14th centuries on the foundations of a Roman castellum, Dracula really could have lived there after all. The Moselle region boasts of wines and quiet, undisturbed villages with great stops along with way for lunch and dinner. In fact, on an earlier trip to Luxembourg I had the chance to test many of the wines during an afternoon. Our gracious hostess that day had actually been raised on a vineyard in the area, therefore, instantly prompting us to insist she take us to her family home where her father still made wine. 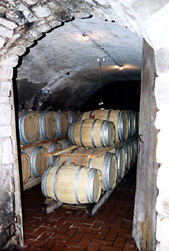 Down in the cellar we went – everyone wetting their lips for a taste of what we knew would be a good wine. It wasn’t long before it was wine for everyone as we happily climbed back up the hill, on our way to the next destination, but a little lighter on our toes for the experience. The Mullerthal is a landscape featuring sandstone rock formations, creeks and forests. The red rock area is well-known with locals who are aware that the prosperity of the Grand Duchy actually came from the red earth, full of a mineral rich in iron. The quarries are no longer used and the earth has taken the land back, but for hikers and those who love the outdoors, it’s a paradise. One final chapter in the Luxembourg story is the photo exhibit, “The Family of Man” in the Castle of Clervaux. It has been called the greatest photographic exhibit of all times. The exhibit was actually created in 1955 by Edward J. Steichen for the Museum of Modern Art in New York. Steichen was of Luxembourg descent and in 1951, during the Cold War, he decided to create a photo exhibit whereby he would make man conscious of himself through the world of photography. He invited photographers from around the world to send photographs to him, which they did, therefore resulting in his receipt of over two million pictures. The images span decades and tell stories unlike any words. Especially those that show happiness or gratitude in the face of despair. It truly does examine that we are all created equal with love or sometimes hate resting somewhere in the soul. The images display the fact that man really does have the power to create or destroy what he makes of reality, and the human conflict of existence lingers in the face of every man. In the 1950s and 1960s, the exhibit drew more than nine million people, however, in 1964 the American government gave the Grand-Duchy of Luxembourg the exhibit to fulfill Steichen’s wish; that his most important work would find a final home in Luxembourg. Since 1748 this company has been making quality products. Most notable the tableware that can be found in the best restaurants and homes around the world. Want to know a secret? You can shop in the store next to the manufacturing facility and find discontinued items at a low cost. Or, do what I did and buy a surprise box for about $50, the tableware inside is mix and match (very hip nowadays), and it’s Villeroy and Boch quality so you can’t go wrong.